As second games go, Scrolls isn’t a departure for Minecraft maker Mojang so much as a full-on transatlantic flight with no return ticket. Minecraft is the everygame, simple enough on the surface to be accessible to all, and with endless creative potential inches beneath its cuboid topsoil. Scrolls is a niche-by-nature marriage of card and board games where creativity is expressed through mastery of a rigidly defined ruleset, and with labyrinthine tactical depths. Just about the only things that link them are a Mojang account, and that both can soak up as many hours as you can spare. It will take time to wrap your grey matter around the intricacies of Scrolls, then, but the idea is easy to grasp. Before you lies a grid of 30 hexes, split evenly down the middle for each player and divvied up into five rows. Lining the left and right edge of the playfield are miniature obelisks, also called idols, with ten life each. Desecrate any three before the opposition can do the same to yours to heap glory and in-game gold upon yourself. But as per collectible card game (CCG) tradition, you don’t do that directly – instead you play scrolls (read: cards) to summon an army of brave knights, deadly swamp monstrosities and killer wolves onto the grid to slash, corrode and gnaw away at the problem for you. And you support that hodgepodge force with immobile structures and buff them up with spells and enchantments. So far, so Magic: The Gathering or Hearthstone, and Scrolls owes a debt to both. It’s there in its Arena mode-alike, Judgement. It’s there in its menagerie of units and structures, each with an attack and health stat. And it’s there in a host of powers condensed down to simple keywords. So a ducal skirmisher with Relentless on it isn’t the aftermath of a sugary drink spillage, but is telling you that it will keep on attacking units until its points are used up. Instead of all your critters attacking every turn as they do in Hearthstone or Magic, though, Scrolls is all about cooldown management and board positioning. Every creature and structure on view also has a countdown stat, telling you how many turns need to tick by before it delivers its attack or special power, and most creatures can move one hex per turn. It doesn’t sound like much, but adds a jolt of fresh smarts, asking you to think spatially as well as weave a tricksy web of effects. You’ll want to plan a few turns ahead, sliding your creatures into place to rip holes in your foe’s defences. And you’ll be forced to make hard choices about how you rejiggle your defenders to cover your idols without exposing glaring weak-spots of your own. Throw in spells and effects that can alter cooldowns or otherwise upset the status quo and there’s dizzying, but brilliant, new room for mind games. Mojang isn’t quite done shaking things up there, either. Once per turn, you may give up one of the cards in your hand for either two new ones, or to swell your resource pool, which is what you use to pay for everything you play. This, again, is transformative. Hearthstone solved the mana screw problem of Magic - where bad drawing luck robs you of the ability to stay competitive - by granting players an increasing number of crystals each turn, whereas Scrolls puts the choice of whichever kind of scarcity you want to deal with into your own hands. All taken together, it ensures most turns present something to tickle your neurons, though that does mean games tend to last upwards of 30 minutes. The selection of modes doesn’t tinker much with that core, but there’s some variety. Alongside the usual quick match, AI skirmish and ranked play, there’s a meaty list of Trials that tweak the rules of engagement, perhaps gifting your AI foe with some quirky combo, such as an army of prolifically spawning bunnies that’s almost too cute to massacre. Judgement, meanwhile, is a pay-to-enter challenge that charges 800 in-game gold or 120 shards (which cost real money, but 120 is roughly 60 of your English pence). It offers the chance to build a new deck by repeatedly selecting one of four random cards from the 350 total, then offers one chance to tweak it before it’s frozen. After that, you try to rack up wins before you suffer two losses, with progressively better rewards for success. Mojang resists aggressive monetisation elsewhere too, dishing out a deck for each faction through play, plenty of achievements with a little pot of gold attached, and sprinkling you with lucre at match end. Shards ease the grind to a new pack or deck, but little else. No, where Scrolls reveals its tears is presentation. Not in terms of looks - the card art is lavish, the animation full of character – but in communicating itself visually. Where Hearthstone wreathes its minions in effects so you can read the board at a glance, this is less forthcoming. You’ll have to mouse over a unit, click, and then pore over its card to discover what it does. If you want to know what keywords mean, you’ll have to click again to flip it over. Cards in your own hand are too small to read without enlarging, too. Just understanding what everything does can gobble ten to 20 seconds of your 90-second turn time, and probably a fair bit longer for the majority of newcomers. It shows in the small player base. Finding normal matches is quick, but you can wait a while for Judgement ones. Patience is required, which also goes for the current metagame. As with many collectible card games, a lot of decks build up inertia, so those who fall too far behind will stay there. That’s not an issue when matches last five minutes total, but it can be trying when you lost a game ten minutes ago and you’re waiting for it to end. You can always surrender, but it feels dirty - and our mamas didn’t raise no quitters. 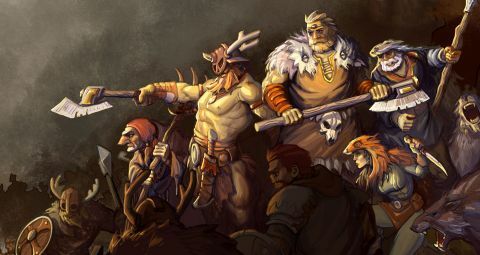 All of this can be fixed in time, and even while Mojang partially clouds Scrolls’ many finer points behind a tough, hide-bound exterior, it doesn't obscure the magic completely. Now all that remains is to blow away the lingering dust of its physical heritage and welcome players more readily, rather than limiting this gripping card game to only the most dedicated of scholars.